We’ve been following Sheridan’s* journey through the ancestry features at 23andMe over the last few weeks. Because she was adopted with no record of her biological parents, every piece of information has been eye-opening for her. So far, she’s learned that her maternal haplogroup is H2a, meaning that her biological mother’s ancestors were likely European, and potentially Eastern European. She’s also learned that, overall, her genome is most similar to Europeans, followed closely by Northern Africans. Her closest mapping to indigenous populations around the world is with the Mozabites of Northern Africa. But because she may have a mixed background, she knows that this mapping needs to be interpreted as an average of where her biological ancestors were from. When we last left her, Sheridan had received a request through 23andMe to connect with a potential 5th cousin. What does this actually mean? Well, for one thing, it means that someone has enough DNA in common with Sheridan to be predicted as a 5th cousin using 23andMe’s Relative Finder feature. Although contacting a potential 5th cousin isn’t quite the same as contacting a biological parent, Sheridan has never contacted any biological relatives before and so is understandably a little bit anxious. Having called it a night after exploring her Global Similarity results, she now takes a deep breath and opens the contact request email. 23andMe predicted that we might be 5th cousins! I am African-American and have some genealogical records that I’m willing to share if you’re interested in trying to figure out how we might be related. Would you be interested in communicating further? Sheridan is astounded. Here is what is apparently an African-American woman with genealogical records who could be her 5th cousin! She isn’t sure how to respond right away, especially since she’s new to this whole thing and doesn’t even know what a 5th cousin is. Luckily, 23andMe has an educational video titled “Just What Is A Fifth Cousin?” which explains very clearly what being 5th cousins means — that she and Akina might share great-great-great-great grandparents. As Sheridan thinks about this a bit more, she realizes that the ancestor that might connect her and Akina would have to have lived around 140-160 years ago. I’m new to all this, and I don’t know if I can contribute much to the search because I’m adopted. But I’m eager to learn more about my — our? — family tree! And just how can 23andMe tell whether Sheridan and Akina might be 5th cousins? 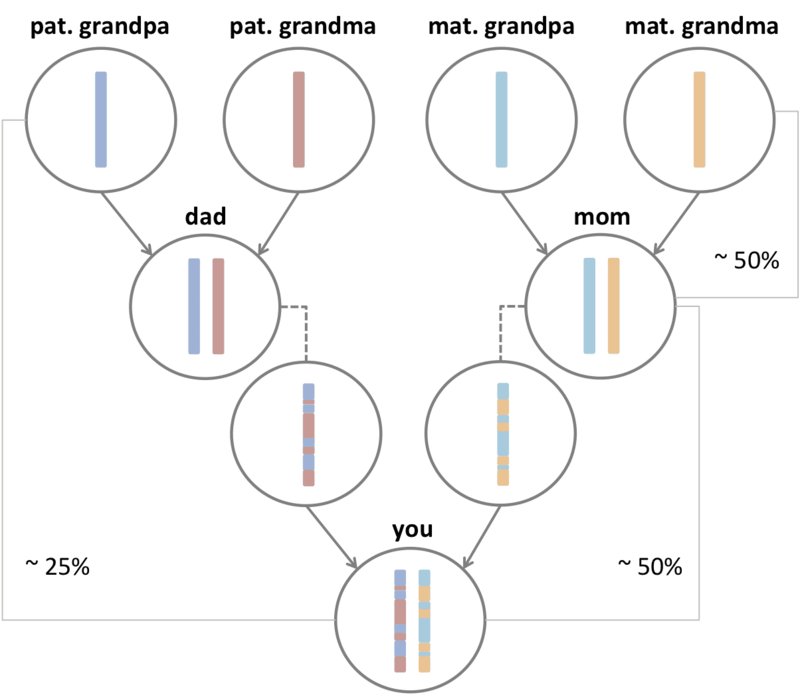 Two major pieces of information go into 23andMe’s Relative Finder predictions: the % of DNA shared and the number of segments shared between people in the 23andMe database. Recall that everyone has two copies of each chromosome (except for the X chromosome in men), one from mom and one from dad. These copies exchange analogous segments of DNA with each other — a process called recombination — before being passed on to future generations, such that the set of chromosomes you received from your mother (or father) is a mix of the DNA that she got from her parents. Since each parent contributed 50% of your DNA, that means that the % of DNA shared between you and each grandparent is roughly 25%. Every generation you go back will halve the % of DNA shared, on average. As you go farther back in a family tree to find a common ancestor, the % of DNA and the number of DNA segments shared decreases. Using data gathered from a set of people with known relationships allows us to develop a model to predict what the most likely relationship might be for a new pair of individuals — like Sheridan and Akina — using their % DNA and number of segments shared. Although the resolution drops off as predictions become more distant, and the exact type of relationship may not be accurate (e.g. “double cousins”, cousins x-times removed, and other less straightforward relationships are not included in our lists of possible predictions), the prediction is generally in the ballpark. Editor’s note: The image to the left shows the Relative Finder feature prior to the Summer 2011 update. 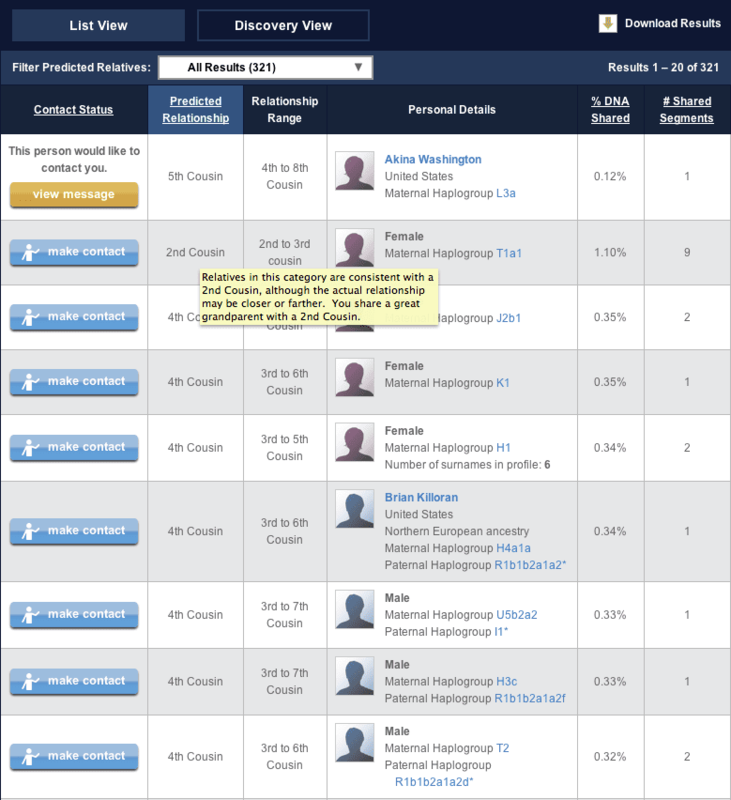 Relative Finder is now also sometimes referred to as DNA Relatives. Sheridan checks the rest of her Relative Finder results (click on image on the left to enlarge) but doesn’t see any matches predicted to be her parents or siblings. Darn! That would have been too easy. As she goes down the list of results, though, Sheridan sees something intriguing. A predicted second cousin? Hovering over this result reminds her that she would share a great grandparent with a second cousin. Introducing Sheridan – We meet Sheridan and she learns about her maternal haplogroups. Sheridan’s Global Origins – Sheridan compares herself and her friends to various populations around the world. (next) Finding Connections – Sheridan and Brian bond over their fourth cousin connection. Old Roots and New Horizons – Sheridan and Brian put together the pieces to sketch out their shared family tree.